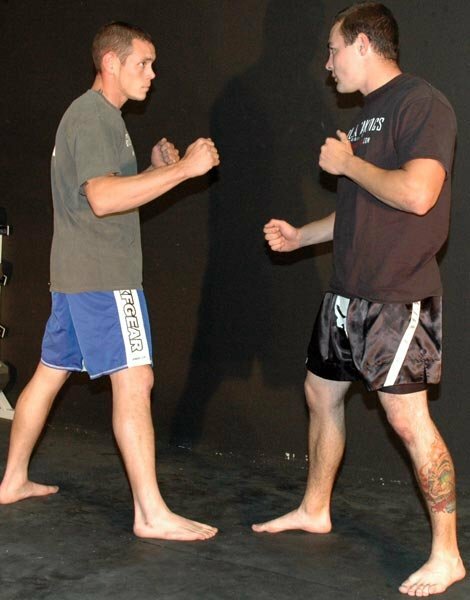 Unlike punches, kicks are the preferred weapon of choice in MMA when encountering an opponent. Get an edge with these techniques and five standard kicks that are important to all fighters arsenal! 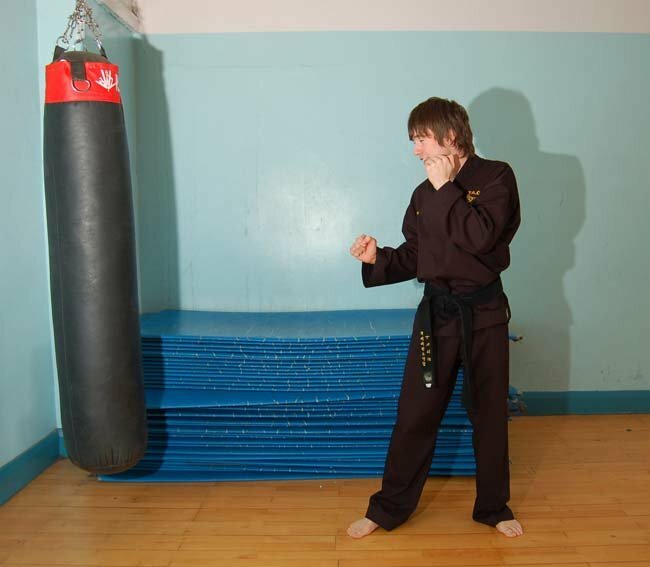 Fundamental to many of the martial arts is an ability to kick, either in a defensive or offensive capacity. Some of the arts, like Tae Kwon Do, Karate or Kickboxing, tend to place more emphasis on kicking, but most, to some degree, require a good level of proficiency in the execution of all the basic kicks, and a sound knowledge of their essential underpinning principals. In MMA competition, kicking can lay the foundation for the groundwork to come, or in and of itself, form the basis of a particular bout. If a fighter is to excel in any of the martial arts that require proficiency in striking with the arms and legs, it is imperative they focus on perfecting all of the main kicking techniques. 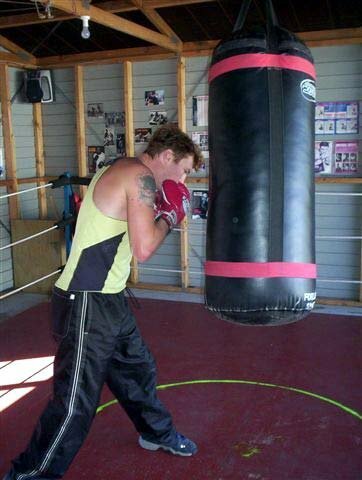 Unlike punches, kicks are the preferred weapon of choice when encountering, either in competition or on the street, an opponent adept at maintaining their distance. A fighter is also better able to generate maximal power through the legs, as this weapon is typically the biggest, and strongest, body part. The position of the kicker relative to the intended target. The type of kick used. The speed with which the kick is executed. The flexibility and overall level of proficiency the a fighter possesses. To become an MMA fighting machine, a detailed understanding of all these variables and how they relate to kicking technique is necessary. Read on to learn everything you need to know. 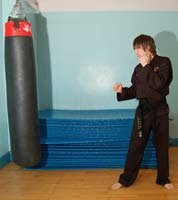 Each of these kicks requires certain technical aspects to be considered to maximise their impact, with main leg techniques centred on snapping and thrusting movements. The idea with snapping a kick is to move the leg as rapidly as possible toward the target, and to return it at a faster rate. Throwing out a kick in this fashion could be thought of as snapping a whip - the idea being to maximise the striking power at the point of impact. This technique is a very effective way to build speed, especially when the objective is to pull the leg back faster than the flicking aspect of the movement. Snapping allows a fighter to control their balance more efficiently, while maximising the power output of the kick. Thus, when aiming for power and control, it is important to use a movement that lends itself to the snapping technique, such as a round kick or sidekick. With this technique, the knees and hips should work in concert with the kicking foot to ensure the kick is executed with the fullest extension possible. In MMA competition the prospect of injury presents itself at a higher level. This increases the importance of controlling your mind if you are to have any chance of being successful. Breakthrough the fear right here! 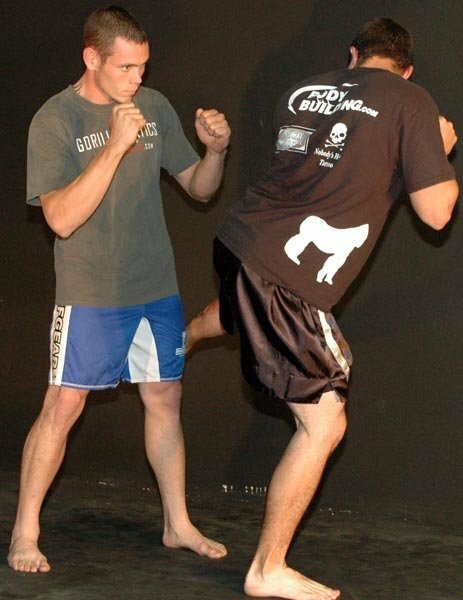 Thrusting type movements, which include variants on the front kick, or certain back kicks, could be thought of as a lower-body punching technique in that a direct, short, route is the best possible angle of attack. The big, bulky muscles of the thighs and hips are used primarily, making the thrusting movement arguably the most powerful kicking technique available. To ensure balance is maintained, and the kick is executed with maximal impact, it is important for you to accurately gauge the distance between yourself and your opponent. If an opponent is just slightly out of range, or too close, you could open yourself up to counter attack, or simply waste valuable resources on a failed technique - the last thing any fighter wants to do. The following basic kicks all rely on the implementation of either of these techniques, and are the types of leg techniques used in all the main "kick/punch" martial art disciplines, including MMA. With a front kick, the striking surface is the ball of the foot, and the target area is usually directly in front of the kicker (this area can be either high or low). To perform the technique, position the foot by pulling the toes back and pointing the foot out. Then, bend the knee at a 90-degree angle (the chamber position), before lifting the leg high and snapping, or thrusting it out. The snapping motion has the advantage of lending considerable speed and can be used to score quick points or target a specific vulnerable area, whereas the thrusting motion generates more power and can be used to push ones opponent back or to really cause some damage. Main weapons of the sidekick are the bottom of the heel and the outer - knife-edge - side of the foot. With the sidekick it is important to pivot directly in front of your opponent so the side of the body faces them. The knee of the kicking leg is, mirroring the front kick technique, bent at 90 degrees, while the supporting foot pivots 180 degrees, so that the toes initially point away from your opponent. The kicking leg is then snapped out, while bodyweight is placed slightly over the supporting leg to maintain balance - opponent is then struck with the heel. The toes of the striking foot should be either parallel or slightly turned down to maximise impact, and reduce the chance of injury. This kick can be done with either the front or back leg; the front leg is faster but the back leg (the more likely option) is more powerful, and generally easier to execute. The round kick, as the name suggests, sweeps around from the side (moving in a arc from outside to inside) to strike a target directly in front. To perform, lift the kicking leg, with the knee bent at 90 degrees, before swinging leg around in the aforementioned arc motion. The inner side of the kicking leg must be parallel to the ground and, at the point of impact the foot should be snapped out, as the target is struck with the instep. To absorb the impact of the strike, the foot should be kept pointed and tight. The round kick can be performed off either the front or back leg: front round kicks are generally a faster kick to perform, as the distance the leg has to travel is much shorter, but there is a trade off as far as power output goes. The back round kick is a more powerful technique, but is much easier to counter, so should be used wisely. 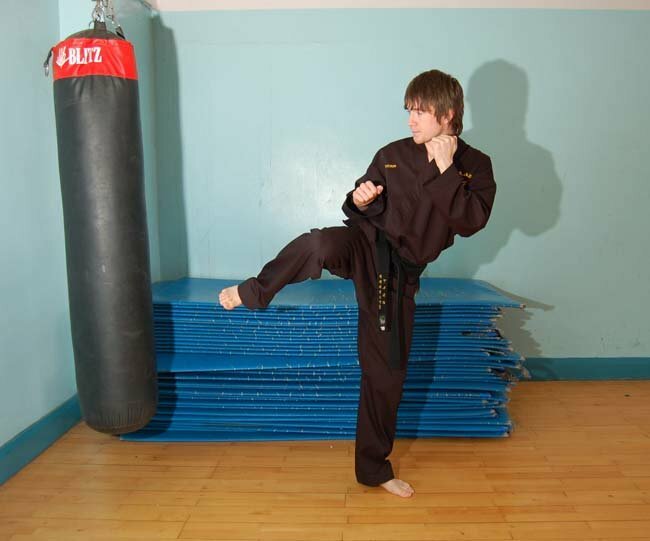 The back kick is a very powerful movement that proves to be a perfect way of countering a round, or sidekick. The back kick allows a fighter to turn in a half circle to deliver the strike, thus generation much force. 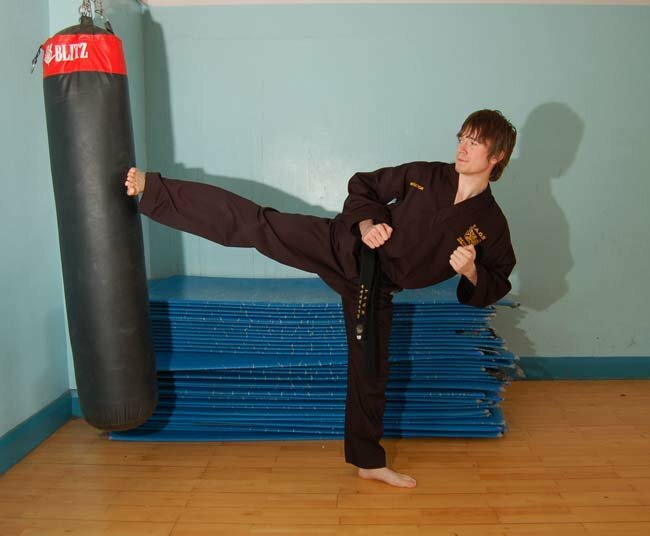 The striking aspect of the back kick is very similar to that of the side kick, in that the leg chambers in the same way and the heel and the outer knife-edge part of the foot is used to deliver the strike. The back kick is designed to hit the target with maximal impact while achieving a complete revolution. To perform, stand in fighting stance and lift the rear leg to the chamber position, as if preparing for a sidekick. Instead of pivoting to the front while bringing leg forward, spin to the back while keeping the kicking leg parallel to the floor. When the back is to the target, turn head and simultaneously strike with the foot. The toes of the striking foot should be parallel to the ground or turned down slightly, while the heel is used as the striking target. The crescent kick is a circular kick that can be performed either inside out or outside in. 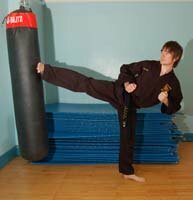 A variant of this technique is the axe kick, which uses the heel as opposed to either side of the foot. The striking surface, with the crescent kick, is either the inner or outer edge of the foot, depending on whether the kick is performed inside out (outer) or outside in (inner). The main idea is to swing the leg as high as possible, and bring it down quickly, on either the head or shoulder of the opponent. With either type of crescent kick, focus on lifting the kicking leg from the ground, up and across the body, and down on the target, with the leg finishing in its original position. Before considering using any of the kicks described in this article, it is important to understand certain principals associated with correct kicking technique. 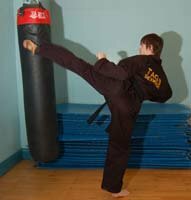 Before executing any kick, the correct chamber position (the position from which the flicking motion of the kick is applied) should be attained. For example, a sidekick to the mid-section would require one to rotate their kicking leg to the mid-body position, before flicking out the lower leg to execute the kick. The idea with chambering is to ensure the leg is raised as high as possible, and kept tight, with a sharp and strong bend at the knee (usually about 90 degrees). This will help to ensure that balance is maintained and the correct route to the kick is discovered. Immediately after kicking, the leg should be re-chambered to the original position. In other words, the attacking foot should not drop at the end of the kick, but return to the chambering position. Here is some insight into developing a foundation while taking a detailed look at what happens during the final few weeks prior to a fight, with expert pointers on what the best pre-fight strategies are. Pivoting typically involves turning on the ball of the supporting foot, with the heel raised, to ensure the kicking leg meets its intended target with maximal force, and at the correct angle of attack. Pivoting and kicking (whether it be a snapping or thrusting) should occur simultaneously. For example, with the round kick the leg, through hip and knee flexion, should arrive in the chambering position as the supporting foot pivots outwards by about 180 degrees. Pivoting & Kicking Should Occur Simultaneously. Power output is increased significantly through correct pivoting, as there is no fixed supporting foot restriction. Correctly pivoting on the ball of the supporting foot will also significantly increase kicking height. The idea here is to lift the heel of the supporting foot as high as possible off the ground, while leaning over the front of the supporting foot and into the kick. Before practicing and kicking technique it is important to thoroughly warm-up and stretch. Stretching will not only enhance performance during the session, but will enable a fighter to improve overall kicking ability over the long term. Inadequate flexibility will restrict movement and technique in many ways: sufficient height cannot be achieved, correct range of motion will be impeded, and risk of injury is more likely. Stretching should usually be preceded with 5-10 minutes of some form of warm-up - walking, running or cycling, for example. Muscles to be stretched include the frontal thigh (or quadriceps), back of leg (or hamstring), hip flexors, and calves. Stretches should be held for at least 15 seconds, and a fighter is advised to aim for an increase in range of motion from session to session. Fighting stances vary among the different martial arts, but there are certain principals that need to be applied regardless. 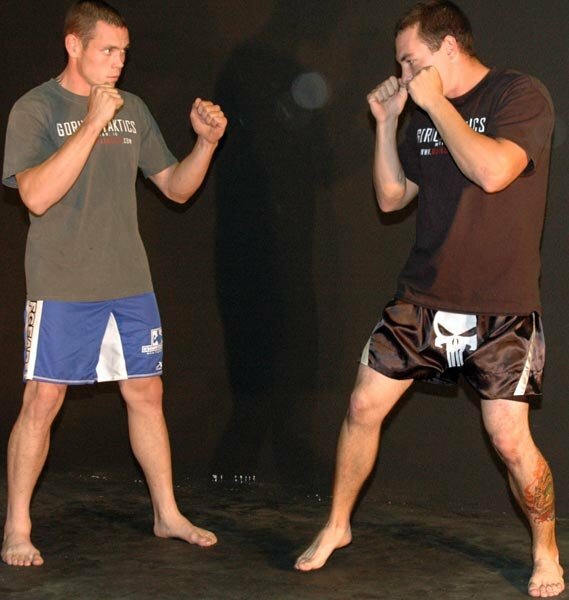 Usually, a fighting stance involves placing the kicking leg behind the leading leg. The leading leg serves to support the kicking leg and is often used to block, or for executing kicks off the front foot. Keeping the supporting leg slightly bent and springy, with the supporting foot firmly on the ground, is important if you are to exert maximal power. Rather than being rigid, the supporting leg must be soft and supple in order to allow the supporting foot to pivot effectively, to enable the fighter to move forwards and backwards with relative ease. 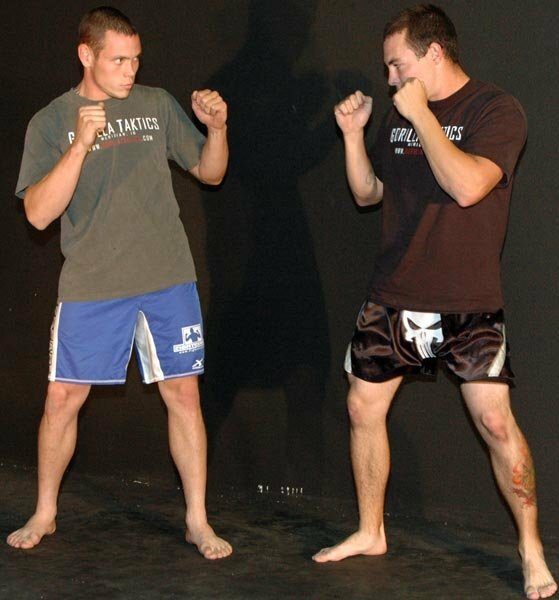 Since a large percentage of kicking power originates from the hips and pelvis, it is important to keep this area stable when standing in fighting stance. Developing strong abdominal muscles through the various crunch variations will help in this regard. Keeping the supporting leg too straight or rigid will restrict ones ability to exert power and kick freely. Learning correct technique and possessing the ability to execute the perfect kick will only take you so far. Picking the right kick at the right time, and applying sufficient power combine to form two key variables that should round out anyone&apos;s kicking repertoire. 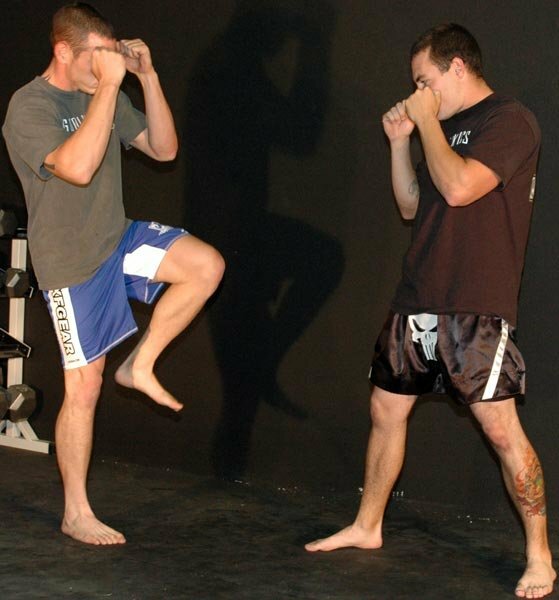 The type of kick used will essentially depend on what your opponent is doing at any given time throughout the fight. For example, an ideal time to execute the jumping back kick would be defensively when your opponent is rushing in, a point in the fight where they would typically leave their body unguarded. In this instance, the attacker would be sufficiently off-balance, which would, in turn, prevent them from stabilising as the kick is launched with full force. Timing is an important concept when it comes to picking the right technique. Waiting for the precise moment to attack is the essence of defensive fighting, and knowing how to read your opponent with a view to pre-empting an impending attack will pay dividends when it comes to immobilising an assailant, or knocking out your opponent in competition. Waiting for an opponent to return to the starting position following a kick is one ideal time to counter with any number of different kicks. A back kick to the mid-section will work well when your opponent is in the process of launching a round kick either to the head or mid-section. Power will generally occur as a natural consequence of speed, but this power can be developed further with the use of a few key exercises. General leg movements such as squats, leg presses, leg curls and extensions will really boost kicking power if done regularly, as will sprints, which provide the added bonus of enhancing the anaerobic fitness levels needed to utilise combinations effectively - whether in competition or on the street - without overtaxing the cardio-respiratory system. Warm-up with 10 minutes of stationary bike riding prior to using this routine. The routine could be performed twice a week. Click Here For A Printable Log Of Leg Power Routine. 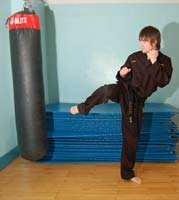 The kicks featured in this article form the basic arsenal of leg techniques for various martial arts. 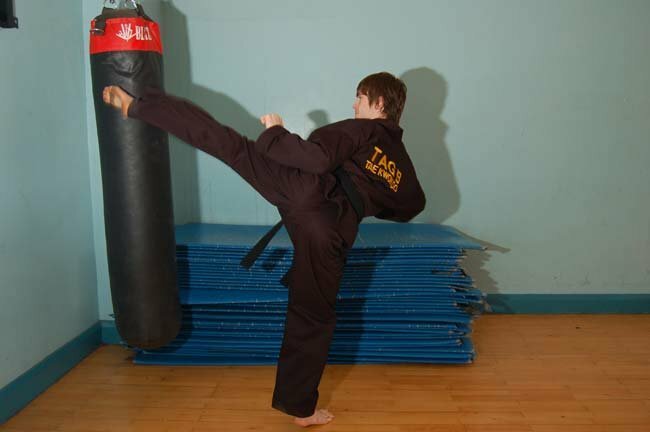 However, there are many more-advanced kicking techniques, which are essential in terms of rounding out a fighter&apos;s martial arts skill base, and allowing for a greater range of fighting options. These will be the subjects of a future article. Stay tuned.